My brother and I even had our own box of ornaments to place on the tree. 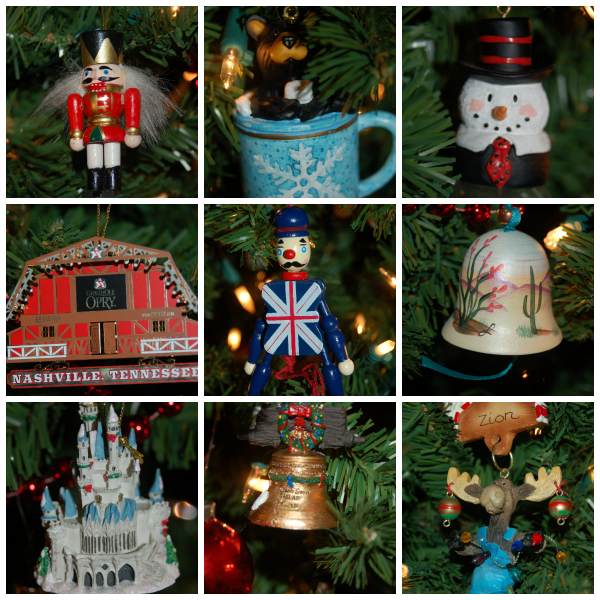 These were random ornaments we had collected over the years; first Christmas, special ornaments, gift ornaments, etc. We had so much fun picking just the right branches to hang our ornaments! 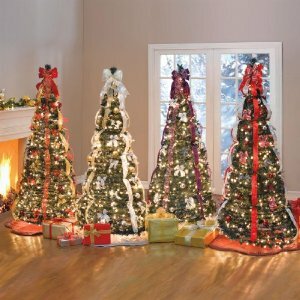 Looking back I wonder why I ever had Christmas tree envy??? We had a great tree and a great family tradition! One that I will always remember and hold close to my heart. My parents made sure that it was about us feeling special and included around the holidays. And the tree itself displayed how we had grown over the years. I’m so thankful to my parents for instilling in me these valuable traditions and for giving me the type of tree that I want my own children to have! Our tree has also become very eclectic. Anyone who comes over around the holidays will find that I just love Christmas ornaments in all their randomness! When AudiÂ and I got married my mom sent us my ornament box. Every year we have even gotten more memory making ornaments as gifts from people; our first Christmas married, in our new home, etc. I can’t wait for BanjoÂ to one day bring home his beautiful school made ornaments and store them away in his very own box! 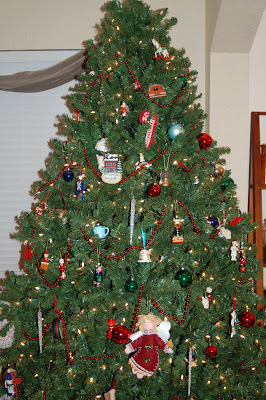 We also started our own tradition of collecting ornaments from the various places we have vacationed. It is fun to decorate the tree together every year and remember what we have done and where we have been throughout the years. That will come with time I’m sure. 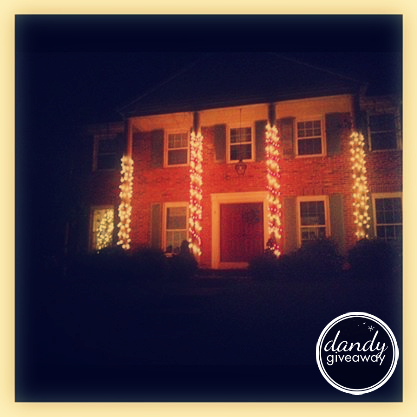 We are so very grateful to finally live in a neighborhood that has a Christmas tradition of its own. 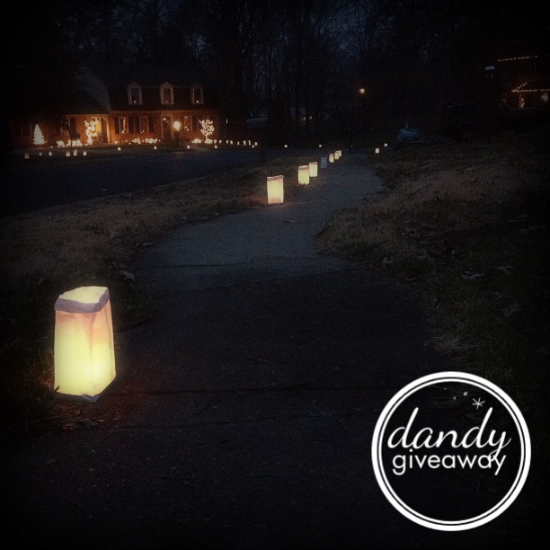 Luminaries line our street every year on Christmas Eve and Christmas Day. *This post was brought to you by MBN.Â All of the thoughts were completely my own. Remember how I posted about those scary bunnies? Â How I publicly aired my fears of creepy clowns and the Easter Bunny? Â No? Â You don’t remember? Â I mean seriously. Â How could you forget??? Â I’m still having nightmares about it. 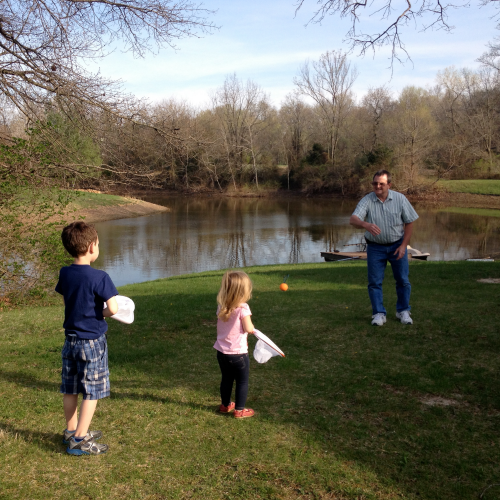 Â This year the “bunny” brought Banjo the Original Djubi Game. 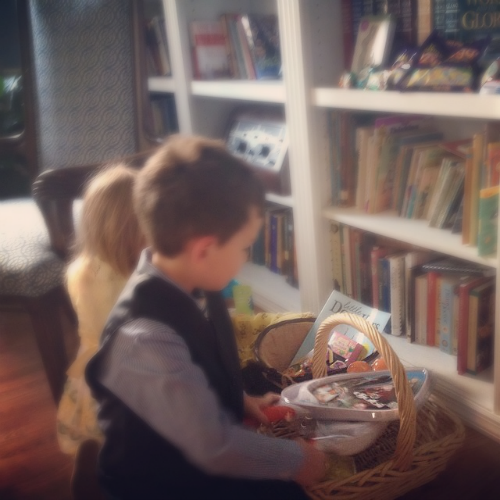 (Thank you, Djubi for sending us this dandy toy for the boy’s Easter basket.) 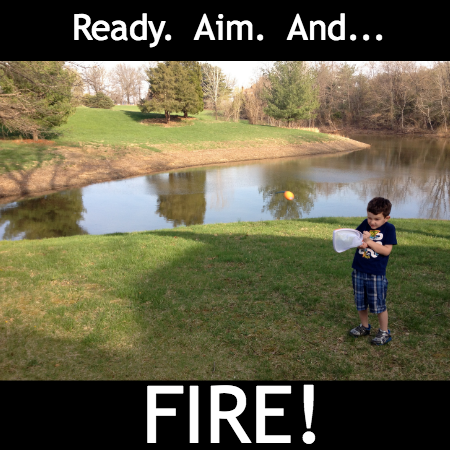 Â If you are looking for a fun backyard game then here it is. Â This is it. Â Good thing I’m posting this just in time for summer, eh? Banjo and Ruby both love it. This is at my parents house. Â Don’t they have the coolest setup with that lake behind their house?! 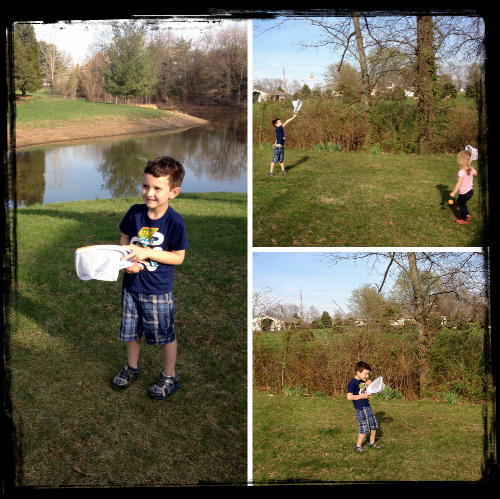 Â My kids love spending time out there. 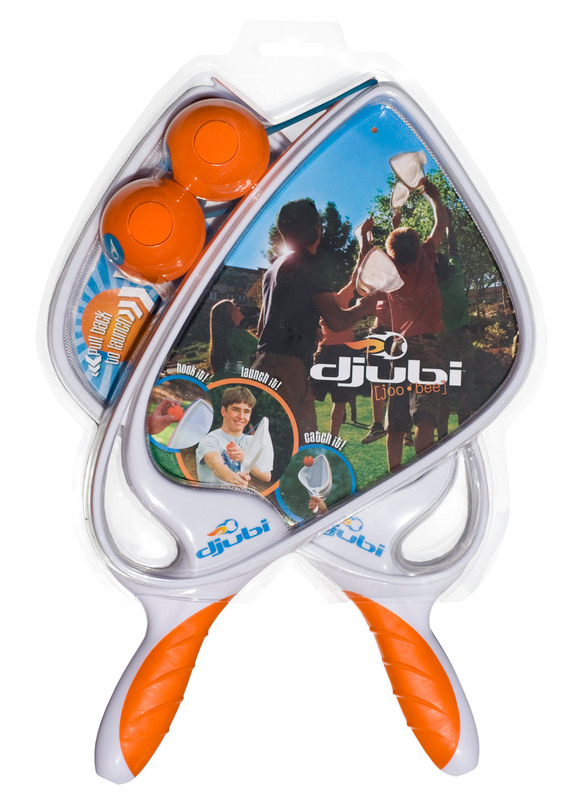 Djubi is perfect for teaching kids of all ages how to aim and catch. Â Adults like it, too! 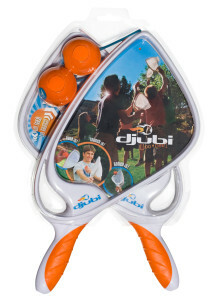 The Djubi ball has a band on it that whenÂ hooked on the handle and pulled back will then soar through the air for the other player to catch. Â Such a unique concept and fun for all ages! Go HERE for the stores where you can find Djubi! *This posting and review are sponsored by Djubi, but all opinions are strictly my own. This set is adequate for as many as 12 guests, as there are twelve dinner knives, twelve dinner forks,Â twelve salad/dessert forks, twelve teaspoons, and a 5-pc. 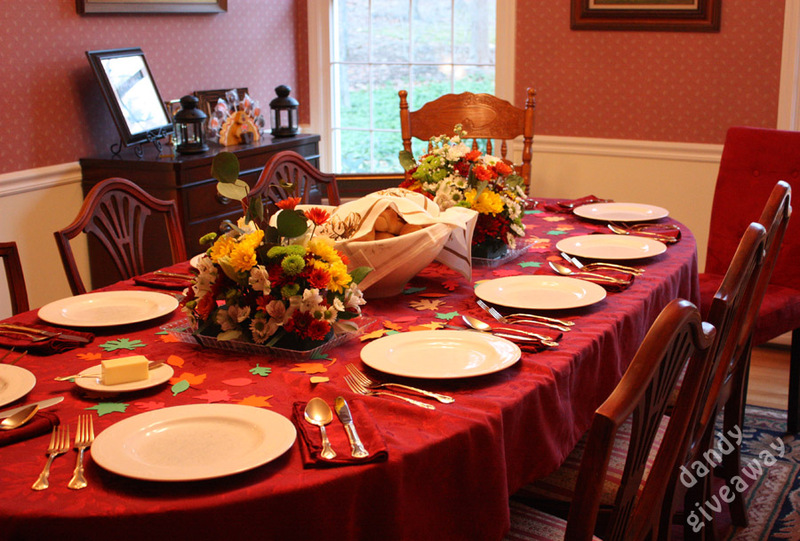 hostess set.Â We’ve already had the chance to use the whole set for our Thanksgiving meal last weekend! 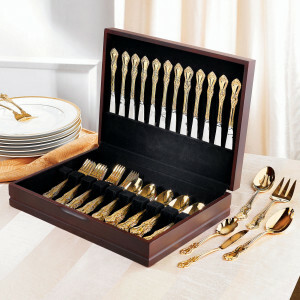 Having a full 12-guest set was just perfect for our Thanksgiving crowd.Â I love how uniform everything looked and how the gold looked next to the Fall colors and flowers.Â My family loved the fine silverware!Â We agreed that this is a stunning set for $99.Â Clearly, they are not pure gold, but who can tell the difference? 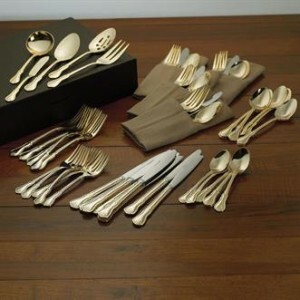 I once taught a lesson to my junior high students about hospitality and offered cake slices on different kinds of plates and with different silverware, and then asked which one they would prefer.Â With similar pieces of cake, of course, you’d like to eat it on fine china with a gleaming silver fork instead of with a plastic spork on a paper towel!Â People notice and care about what they eat with! Imagine eating with a piece of gold in your fingers.Â These look like works of art, and the color is just brilliant.Â Someone could have told me that these were solid gold, and I’d believe them. 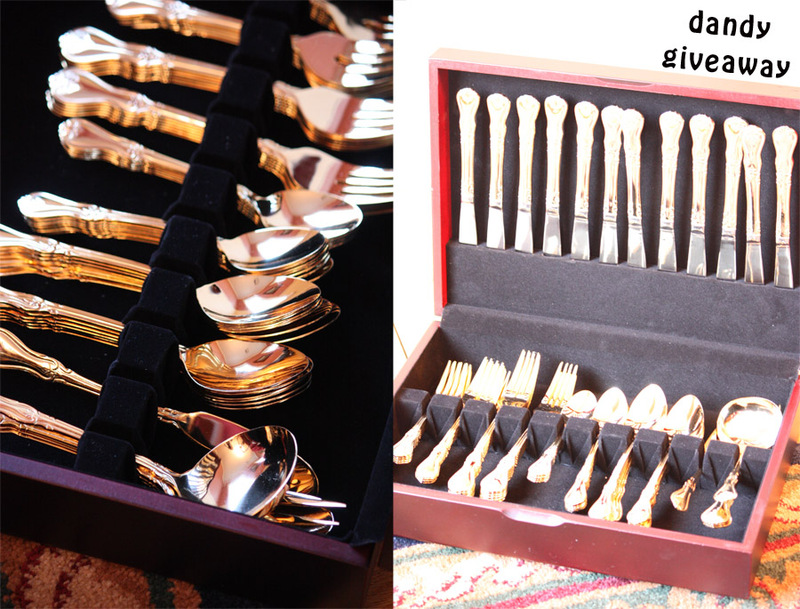 These arrive in a wooden storage box that is just as high class as the flatware.Â It feels like solid wood and it is lined in plush material with slots that keep the flatware separated and stationary during storage. 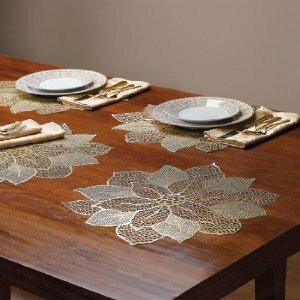 This flatware set is only one of many beautiful dinnerware and entertaining products and decor that are perfect for the holidays.Â Look at these gorgeous placemats, Christmas trees, and even a Christmas comforter set! Our family has been able to review several items from Brylane Home, and we are more and more impressed with each one.Â Everything has arrived quickly, well-packaged, and built-to-last.Â Brylane Home will be the first site I recommend to anyone furnishing a new home. 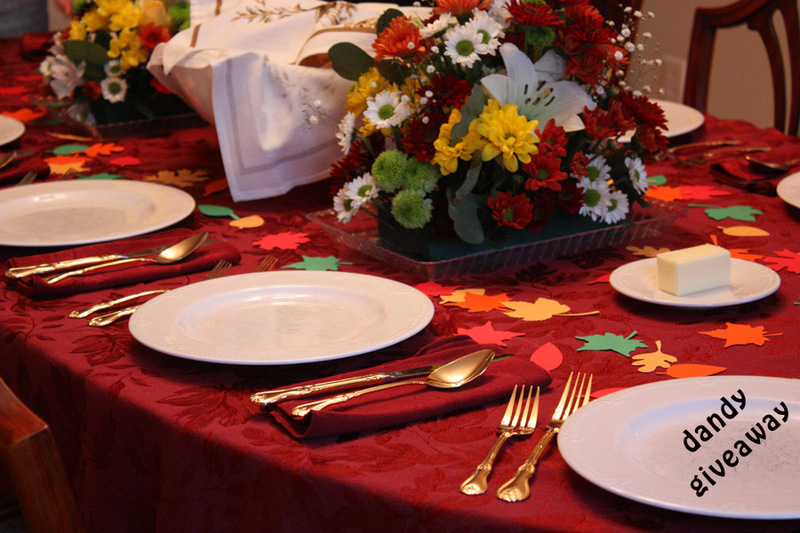 Visit Brylane Home and stock up on holiday decor in time for Christmas! 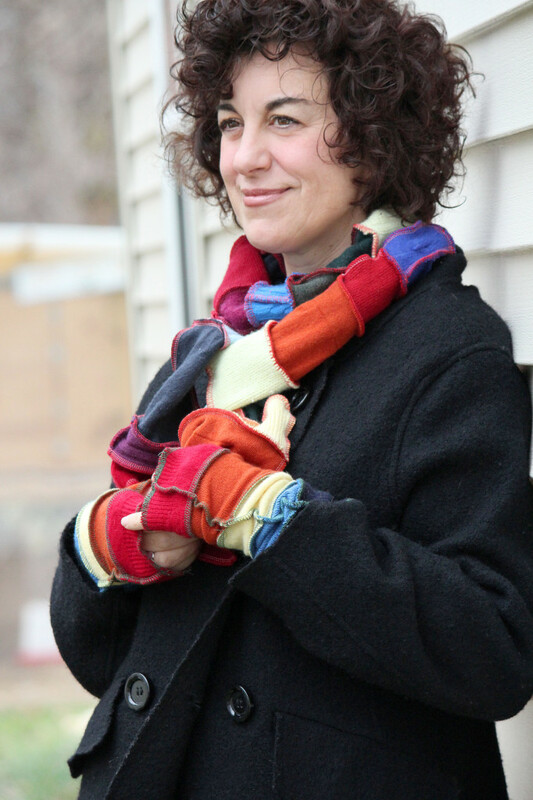 What?Â A set of arm warmers and a scarf fromÂ The Painted Daisy. Why? Â Because baby it’s cold outside! Â 🙂 Â There are so many beautiful and warm accessories to choose from that will bring a smile to the face of the recipient. 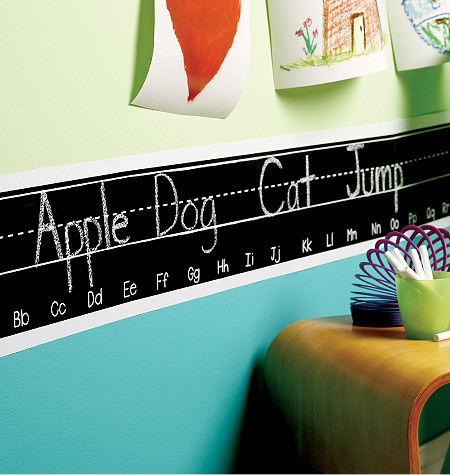 What?Â Â Vinyl wall decor from Old Barn Rescue Co.
Why?Â They are the #1 Language Learning System for Children and your kid/grandkid/whoever will LOVE learning another language with their DVDs, digital videos, CDs, flash cards and books. See my review HERE. It’s time for Val’s Holiday Gift Guide! I haven’t been “in business” as long as Tara and Camille, so this is my only Gift Guide this year. But that doesn’t make it any less amazing! Check out the following companies/products below and you should be able to find something for just about everyone on your list this year! Whooz? Vinyl Labels for iDevicesÂ was designed to solve the problem of lost, stolen or â€œborrowedâ€ cords and cables for iDevices.Â These vinyl labels cover your charger cables so they are easily identifiable and stay organized in your drawer/purse/wherever you keep all your cords and cables. They come with clear instructions and are really easy to put on. 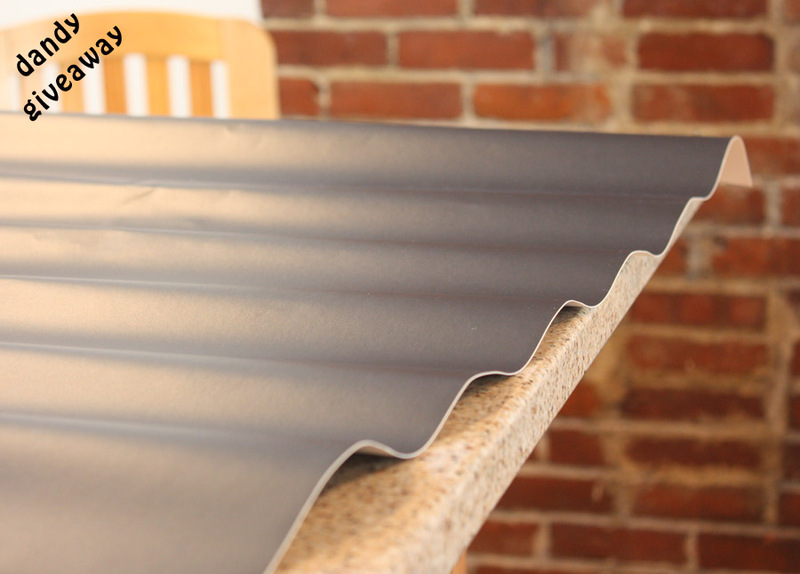 The vinyl is good quality and shouldnâ€™t rub or peel off easily. Each pack of labels comes with four designs and they just released three new sets of designs for the holidays. 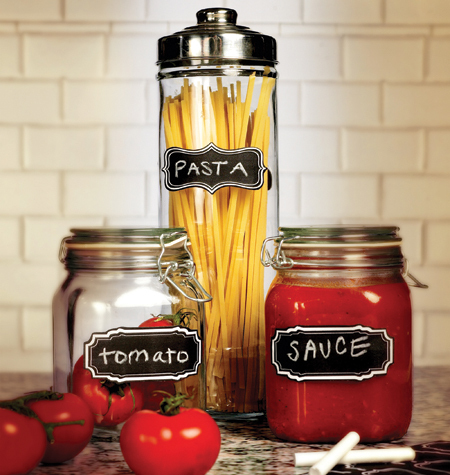 Look for another giveaway of these awesome labels coming soon! Fabness CanvasÂ is an easy-to-use online canvas printing site. 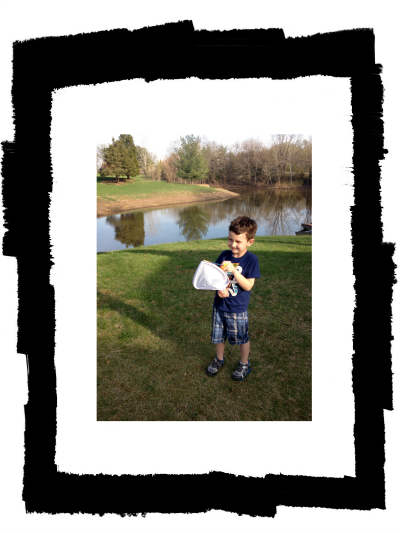 Â The process is simple: in just five easy steps you can have a beautiful, professional-looking canvas print of any picture you choose. It ships quickly and arrives perfectly packaged to avoid any damage. The quality is superb. Believe me when I say you will LOVE your Fabness Canvas! And lucky for us Dandy readers, Fabness is extending a special deal to us for up to 82% off! 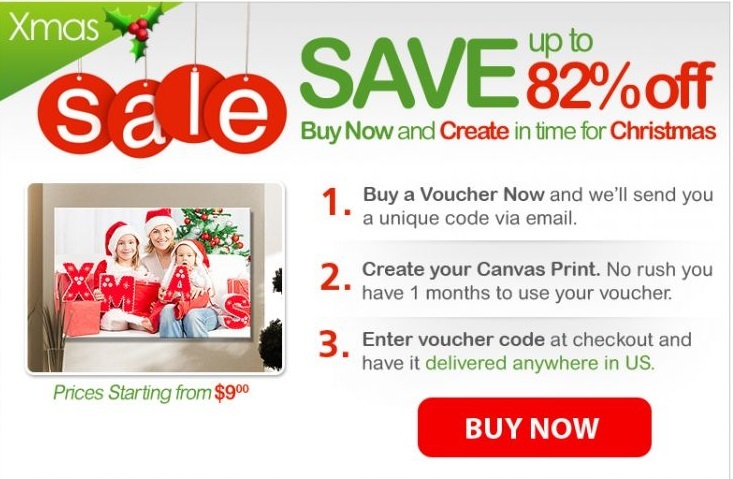 Order now to get your canvas in time for Christmas! Â The sale ends at midnight on November 26, so hurry! This is truly a great gift for anyone. 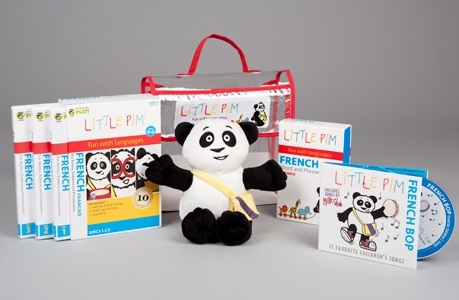 Little Passports is a monthly subscription service that helps your child learn more about the world around him. Monthly packages transport your child to either another country (the World edition) or a state (USA edition) and teach them all about the local customs, historical landmarks, foliage, animals and much more. 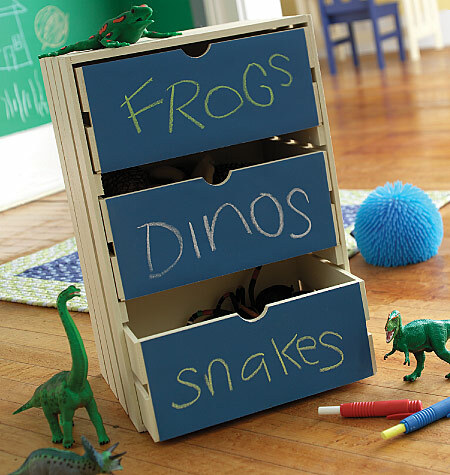 The activities, stickers, and field guide can keep kids busy and learning for hours, and they look forward to receiving their package in the mail every month. Little Passports is better for older children (ages 5-12) but even the little ones can appreciate learning about the world around them. the Petunia Ballerina Mouse (available in two sizes! 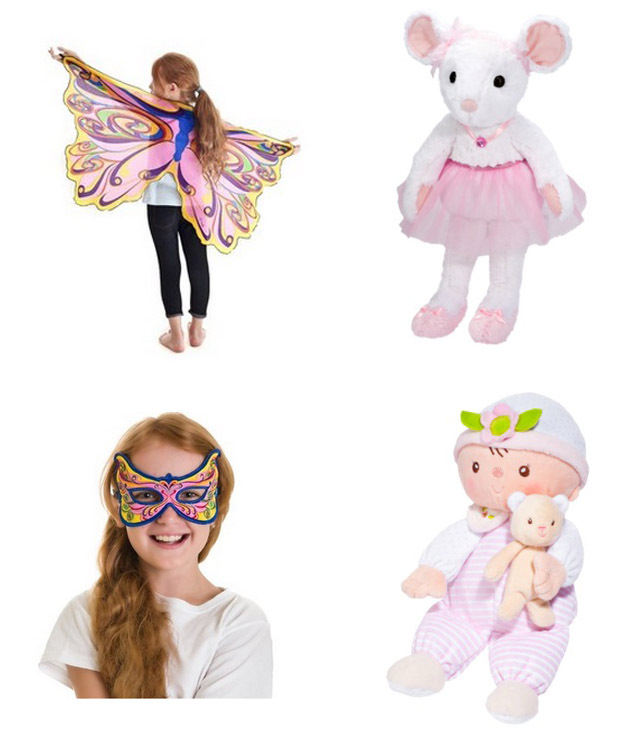 ), theÂ InfantÂ Claire Stripes & Dots Doll, andÂ the Dreamy Dress-UpsÂ rainbow fairy maskÂ andÂ Rainbow Fairy Wings with Glitter. Be sure to check out their extensive line of plush animals to find the perfect stuffed animal for any animal lover! 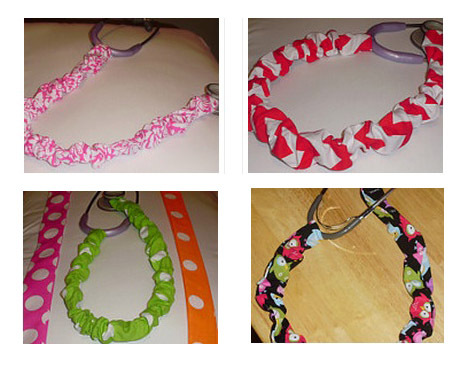 Kellyâ€™s Funky KreationsÂ is an Etsy shop with a variety of homemade items and a ton of personality! Kelly makes everything from beautiful door wreaths to baby hair bows to awesome safety pin watches, but one of her most creative creations are her customÂ Stethoscope Covers. She currently sells them in a variety of fun, colorful fabrics, but if you have a custom order she will work with you to create the perfect gift. 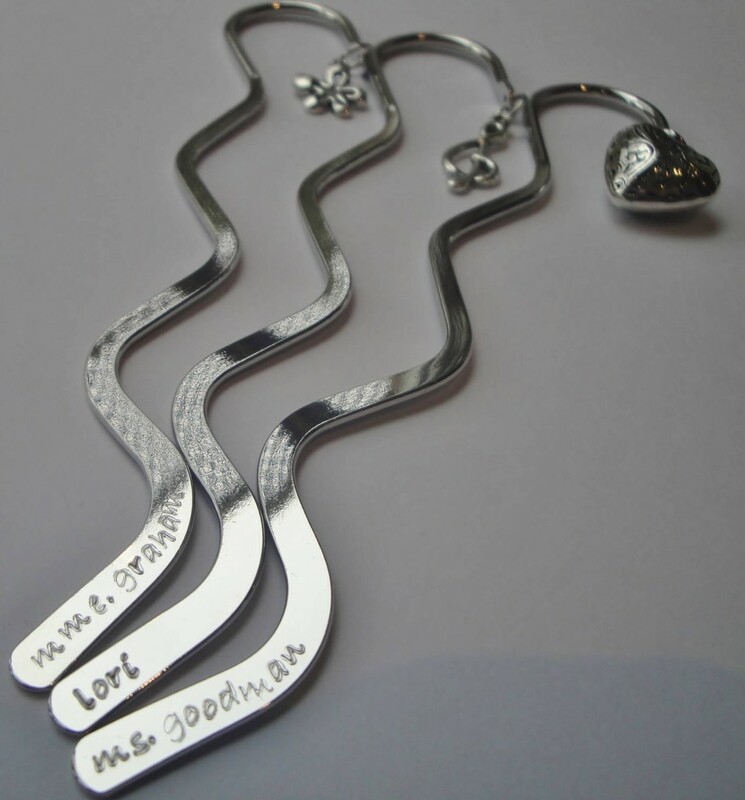 Think how happy your nurse/doctor/PA friend will be when she has a cute, bright stethoscope around her neck! 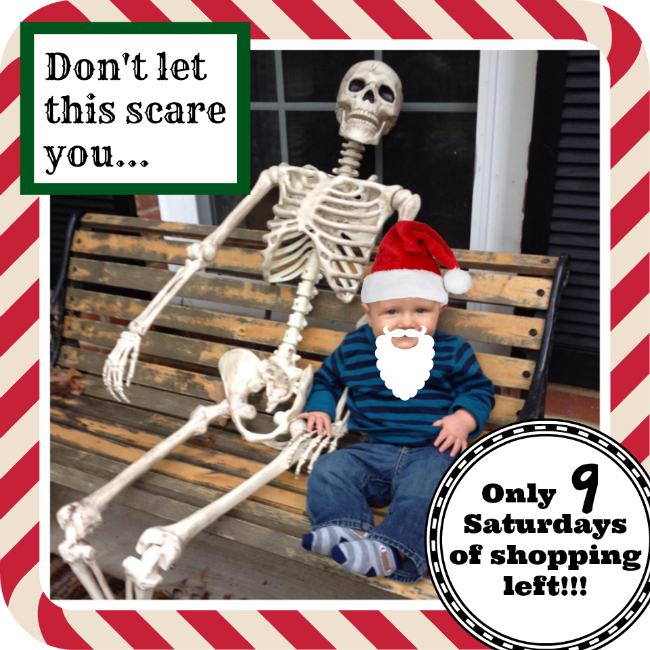 Happy Shopping, Dandy-ites! 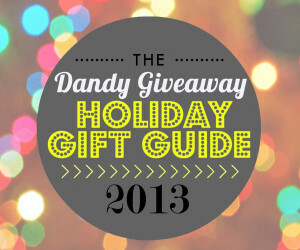 Keep posting in every few days for the next round of awesome Holiday Gift Guides! 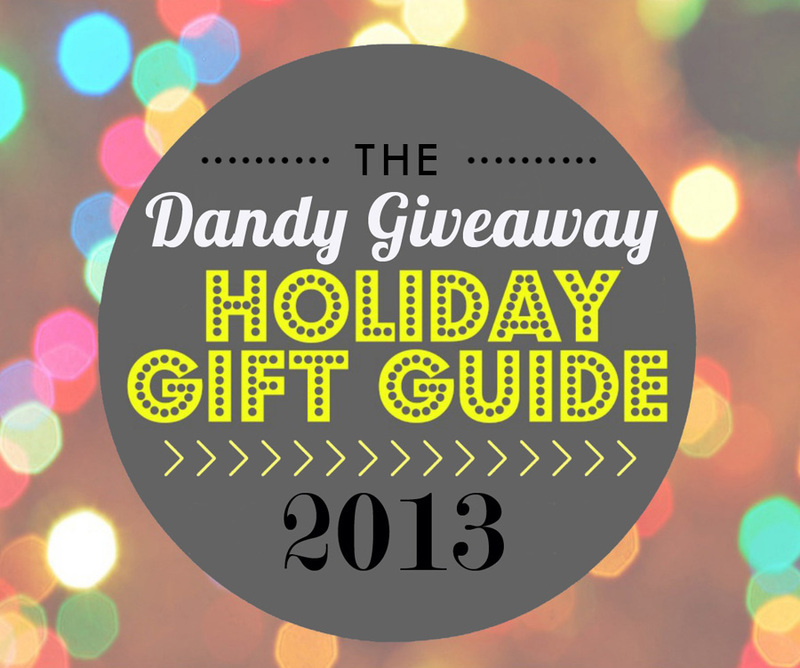 So here’s our 1st edition of holiday gift ideas for 2013! What? Â A personalized bookmark from Alli’s Originals. Why? 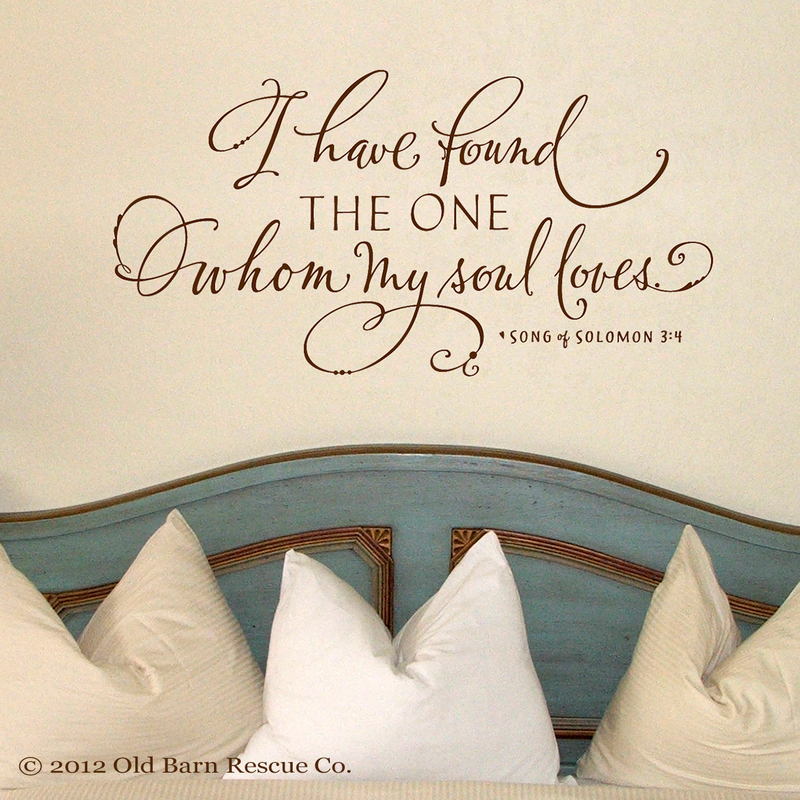 Â Something hand stamped is unique and always makes the perfect gift. 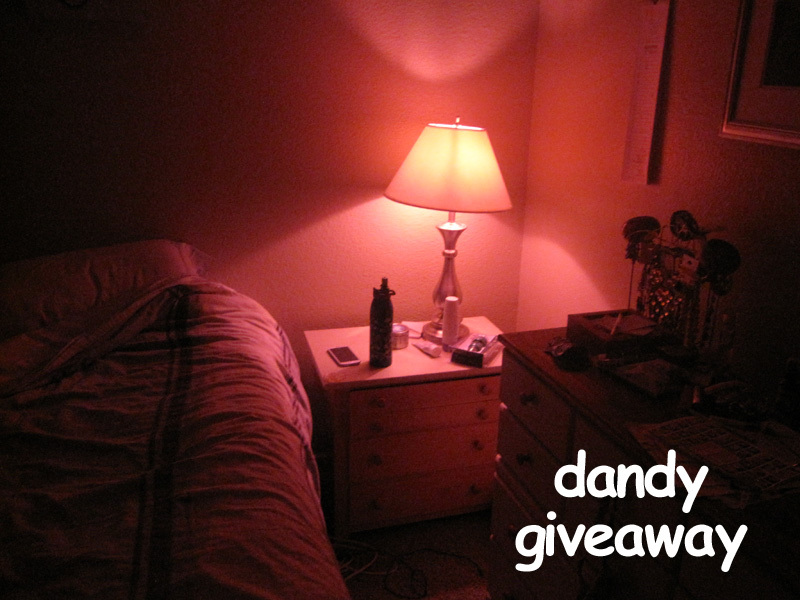 Â Plus, Alli’s Originals is offering Dandy Giveaway subscribers a 10% discount. Â Enter at checkout code: Â ao10%07 to redeem your discount! What? Â A language learning program from Dino Lingo. Why?Â Available in 40 different languages and the perfectly fun way for kids to learn. Â Plus, there’s a Thanksgiving special going on right now! Â Use coupon code: THANKS10 to receive 10% off, a 2014 dinosaurs calendar, and free shipping (in the US). What? Â A toy vehicle from Worx Toys. Why? Â Given Top Toy of the Year Award for 2013 and quite the toy it is! 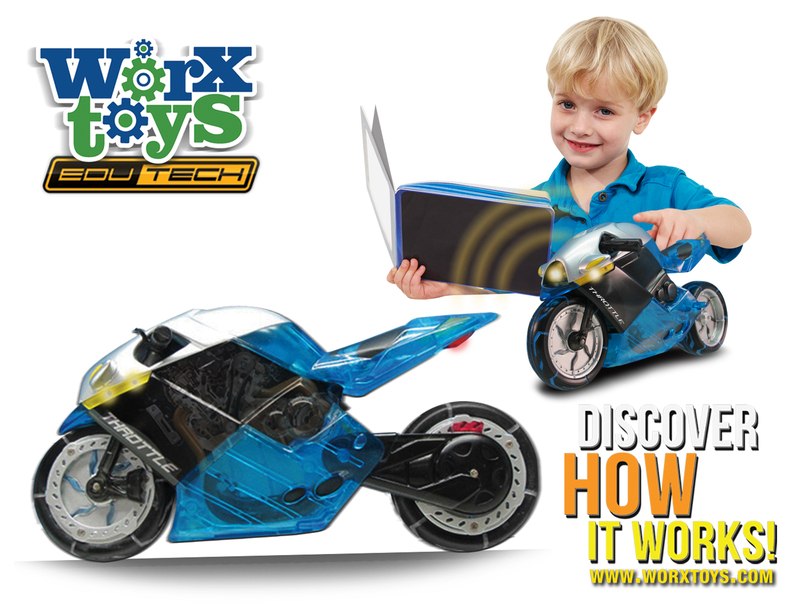 Â The vehicles teach kids how they work and at the same time allow kids to have tons of fun watching them work. 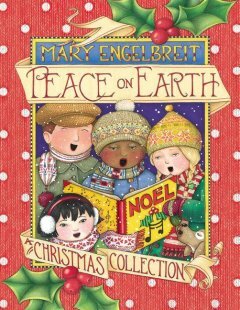 Christmas and Mary Engelbreit.Â Two of my favorite things! !Â I’m thrilled to tell you about her new Christmas book, called Peace on Earth, A Christmas Collection.Â This is a collection of carols, stories, and poems that ring in the holiday and celebrate it in all its wonder. This is the perfect book for putting you in the Christmas spirit!Â There are familiar carols and familiar scriptures, along with some new poems and stories that I’d not read before, but loved just as much.Â Same with Mary’s artwork.Â She has some classic illustrations that I’m so glad were included, along with some that I’ve not seen. There are 40 pages of delightful artwork in this hardcover, jacketed book.Â The colors are bright and vivid and there is so much to look at on every page.Â What an artist she is!Â On any given page, there are so many things to fall in love with.Â The attention to detail, from the border trim to eyelashes is intentional and beautiful. As an artist, Mary Engelbreit has been a favorite of mine for years and years.Â She has such a way of brightening spirits with her cheerful colors, prints, words, and drawings, and this book is one of her best.Â The cherry on top is the glittery snowballs on the front cover dust jacket! I think this book would make the most wonderful hostess gift.Â This book wrapped up with a plate of cookies on top would be so thoughtful, for mother and child, and something that could become a yearly tradition.Â I split this up among two nights and enjoyed every minute.Â I can’t wait to read it to my boys.Â I’ve decided that yes, this will be a tradition in our household! You can purchase this book for $17.99 from Zondervan HERE. I received this book free from the publisher through the BookSneeze.comÂ® <http://BookSneeze.com> book review bloggers program. I was not required to write a positive review. The opinions I have expressed are my own. 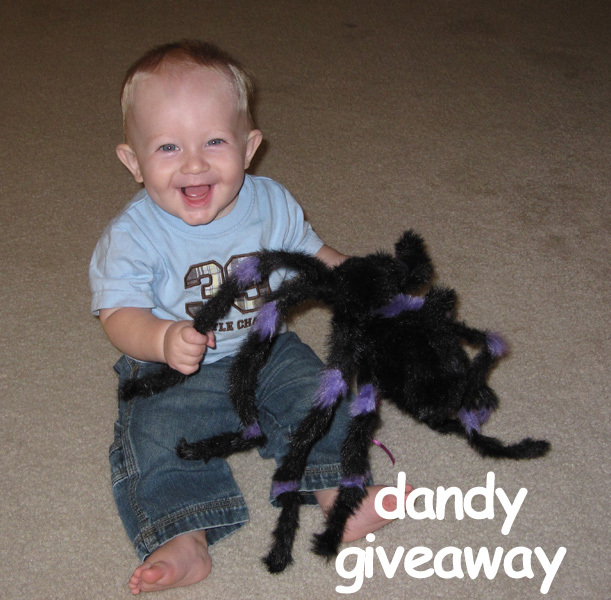 This is from when my son was a baby–it scared him for a minute and then he loved it! This year, my daughter was freaked out by it and wouldn’t even go out the door by herself where it was hanging for a few days! That said, we’ve had to figure out alternative ways of making our house look spooky without totally scaring our kids. Colored lights are a good way to do that! Mood-lites come in several shapes and sizes. All of the colors come in standard 25-watt incandescent bulbs, 60-watt spiral CFL bulbs, a 2-pack of 25-watt candelabra incandescent bulbs, and 90-watt outdoor flood lights. All of the bulbs fit in standard light sockets and function just like normal light bulbs. But they sure don’t act like normal light bulbs! I was sent a package with a variety of lights, and I tried out the pink Sassy light and the purple Passion light. The Sassy light bulb was a welcome addition to our bedroom…and that’s all I’ll say about that because I know my mother-in-law reads this blog 😉 And the purple Passion bulb added to our Halloween decorations perfectly this year, casting an eerie glow on our front porch while still giving off light and not being too scary. 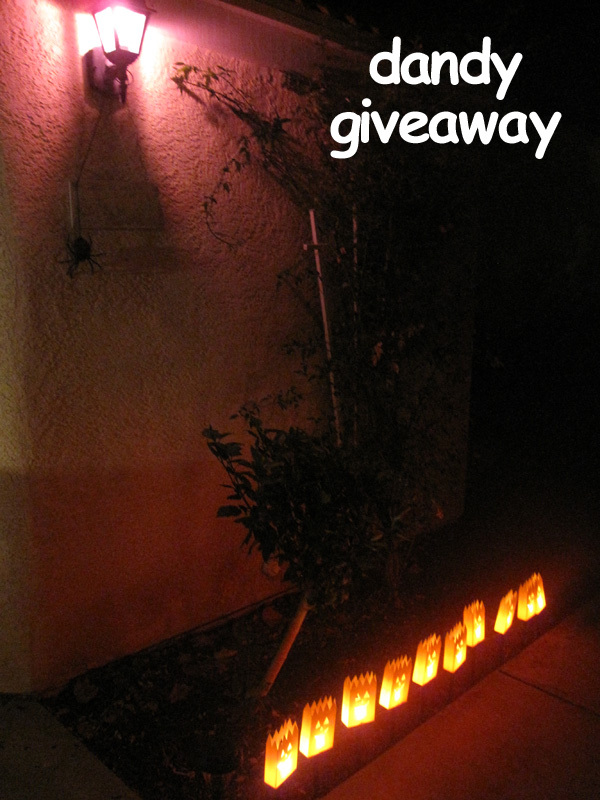 We kept a green CFL bulb from the package of goodies and plan to use it on our porch during Christmas. Think of the uses these babies could have–sports team colors for game days, different colors to support health awareness (i.e. blue for Autism awareness month, pink for Breast Cancer awareness month, etc. ), Â pink or blue at a baby shower or to reveal the gender of a baby after its birth, orange (Energy) lighting where you work out–the possibilities are endless! 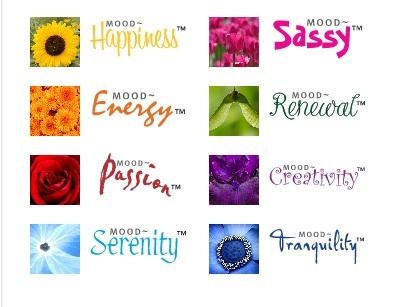 Mood Factory is also great because they support several charities and causes. Twenty-five cents of each light bulb purchased is donated to i-Fred, an international foundation for research and education for depression. Mood-lites can be purchased at Lowe’s and Amazon.com for about the same price as a normal light bulb. But, lucky for you, one winner is about to get a whole package of goodies from Mood Factory by entering the giveaway below! 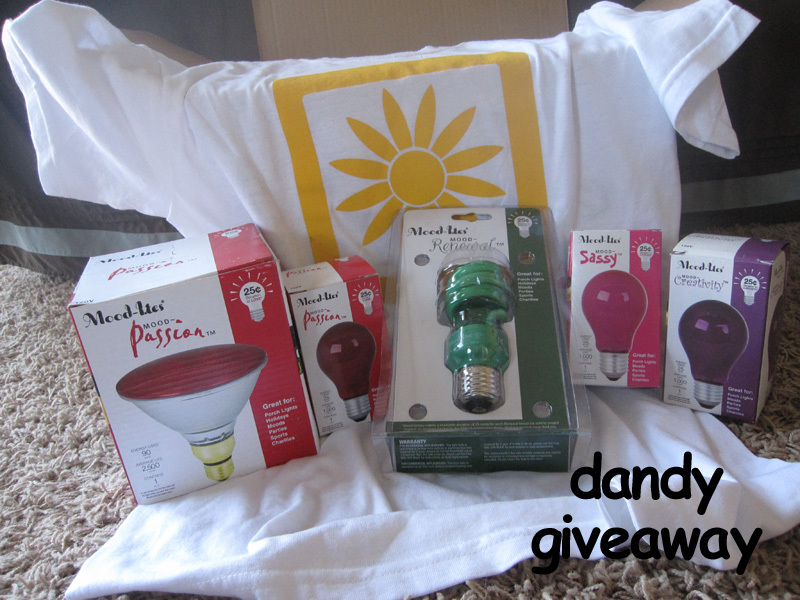 Win a box of Mood-lites from Mood Factory! **Because I was sent the winnerâ€™s prize items along with my review items, the winner will be responsible for paying shipping from me to you, via PayPal invoice. ** The winner of this giveaway will be drawn no later than the morning of November 11th, 2013, and will be emailed within 24 hours.Â If the winner does not respond within 48 hours, a new winner will be drawn. ** This posting and giveaway were sponsored by Mood Factory, but all opinions are strictly my own. My Aunt Tami is a huge role model to me.Â She has the most adorable (and always well-dressed) children, has some fantastic recipes up her sleeve, takes time to dress fashionably herself (even with six kids! ), and her house is always decorated to model-home quality.Â We stopped by a few months ago and I was reminded of how much I love Aunt Tami’s style.Â One of the most memorable additions to her charming kitchen was a side cupboard panel that had been turned into a chalkboard wall.Â Just darling! 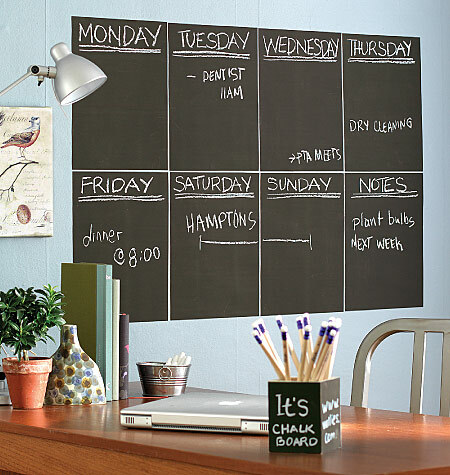 My mind starting spinning with ideas of how to do something like this in our kitchen, even though we’re in a rental.Â Painting the built-in cupboards isn’t really an option.Â When I saw these chalkboard papers from Wallies, I freaked out a little inside.Â My chalkboard wall dreams were obtainable! …but as you can see, once applied to the flat surface, the wrinkles aren’t a problem.Â I only wish that there was a square grid behind it, on the peel-away paper, to make cutting and trimming easier.Â I applied this first with tape up the sides, and then ripped away pieces at a time and smoothed it down with a shower squeegee.Â It only took one application, but even if that doesn’t happen, this is re-positionable, so mistakes can be corrected. I’m so happy! 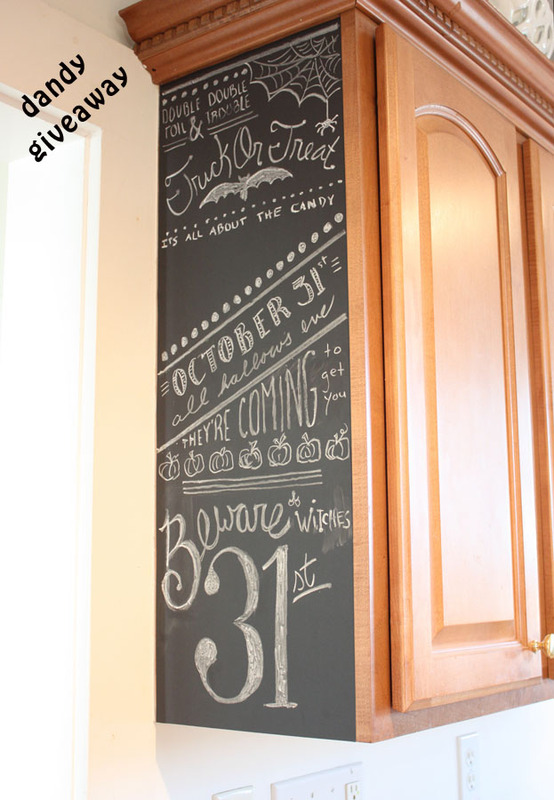 !Â I can’t wait to do some artsy writing every month according to the season and holidays.Â Without a lot of storage space for holiday decorations, I’m really liking the decor that can be interchangeable and stay out all year.Â I still have more than half of the sheet leftover to try on other surfaces, and it looks exactly like a real chalkboard.Â Completely legit. 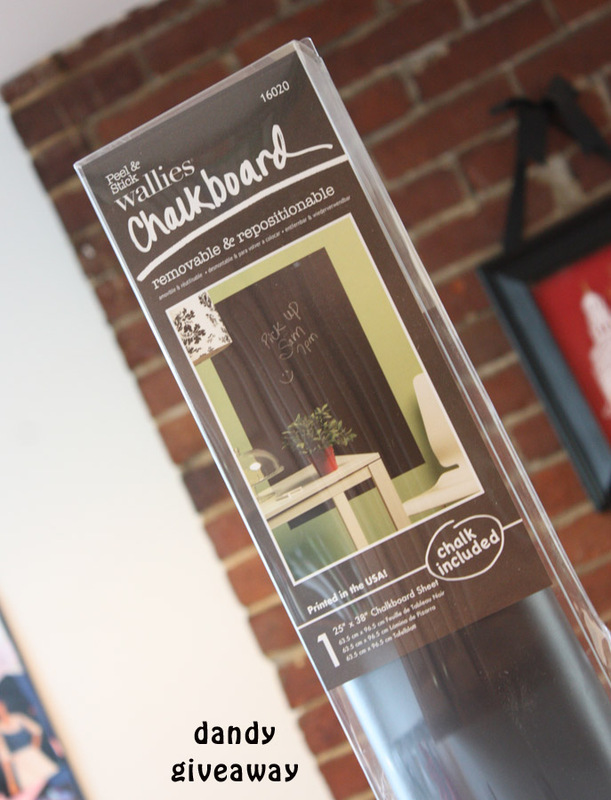 Wallies has a number of chalkboard decals, among all sorts of decals, cutouts and murals, and even Holiday Wallies! Check out all the beautiful and fun fun fun products from Wallies and get some fun holiday decor up in your home!